Here are answers to basic user questions about CAFE, grouped by topic. Q. How can I get CAFE? A. To get a copy, download CAFE (both Windows and Mac versions available) from this website. Follow the on-screen instructions to install it. Q. How much does CAFE cost? A. CAFE is free, as are the other software programs offered by the Emergency Response Division of NOAA OR&R. Q. What is the latest version of CAFE? A. The latest version is 1.2 (June 2016), and is available for download from the page, Downloading, Installing, and Running CAFE. Q. How often will CAFE be updated? A. CAFE will be continually updated and improved. Let us know your ideas and suggestions to improve CAFE. Q. What computer operating systems are compatible with CAFE? A. You can install and run CAFE on Windows or Mac operating systems. CAFE for Windows can be run on Windows 7, 8, 8.1, and 10 operating systems. CAFE for Mac can be run on Mountain Lion (10.8), Mavericks (10.9), Yosemite (10.10), and El Capitan (10.11) operating systems. Operating systems not listed here have not been tested and are not supported. Q. Is CAFE available for smartphones and tablets (such as iOS or Android devices)? A. No, CAFE is currently only available as a desktop program. Q. Is there technical support for CAFE? A. On the page, Getting Started with CAFE, we provide a number of resources to help you use CAFE, ranging from its basic use to detailed technical details. In addition, we’ve created videos on a number of topics to help you get up and running. If you need further assistance, you can email the CAFE Specialist at OR&R. Q. What are the main components of CAFE? A. The following table shows the main components and their functions. User-Added Data Add your own toxicity data to CAFE, and view, edit, import, export, or delete your data. Q. What are the sources used in CAFE? A. Fate sources include the SRC, Inc.'s PHYSPROP database, the National Library of Medicine’s Hazardous Substances Data Bank, the U.S. Department of Commerce’s National Institute of Standards and Technology, and the EPA’s EPI Suite™. Primary sources for effects include the EPA’s ECOTOX database; the European database, ECETOC; Research Planning, Inc.’s DTox database, and peer-reviewed literature and reports. A. CAFE was developed by NOAA’s Office of Response and Restoration, in collaboration with Research Planning, Inc.
Q. What kind of software is CAFE? A. CAFE was created with FileMaker Pro®, a fully relational database program that allows us to bundle the chemical and oil data with the FileMaker Runtime engine. Q. Where can I find more information about CAFE? A. On the page, Getting Started with CAFE, we provide links to published technical papers that provide extensive detail about the development of CAFE. Q. Where can I find the definitions of the physical properties? A. Each physical property has a help button, , that provides its respective property. Q. What is Data Applicability? A. Each toxicity data record (row) within CAFE was scored (e.g., high, moderate, low), based on its applicability to chemical spill response. This score was judged based on source-specific considerations. Refer to Appendix A of the CAFE User's Manual [PDF, 5.7 MB] for criteria. Q. What are Species Sensitivity Distributions (SSDs)? Q. How do you read a SSD curve? A. The X-axis represents the concentration required to adversely affect the aquatic species based on a logarithmic scale. The Y-axis represents the percentage of the affected species. Species located to the left of the curve are more sensitive than the species to the right of the curve. Q. What is an HC1 or HC5 value? A. The estimated HC1 and HC5 (µg/L) values are derived from an SSD curve and are used as hazard concentrations under the assumption that these would be protective of 99 percent and 95 percent of the species, respectively. Q. What is the formula used in creating the SSD curves? Q. What do the color codes mean? A. 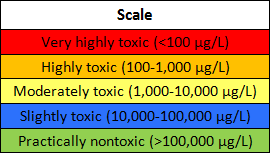 The following color code scheme was adopted from the U.S. EPA Office of Pesticide Programs, representing a common scale of relative toxicity for aquatic organisms. More questions, comments, or suggestions? Contact us.